Frequent coverage of mass civilian casualties, war crimes, and refugee crises by American media have understandably made the words “Civil War in the Middle East” almost synonymous with the Syrian Civil War. However, it’s not the only civil war currently being waged in the Middle East. Over the past three years, Yemen has been dealing with its own civil war and humanitarian crisis. Chronic regional instability, governmental corruption, and a poor economy have plagued the Republic of Yemen since its inception 30 years ago. As a result, Yemen has become a hotspot for internal conflict. Moreover, the ongoing civil war is its worst so far. As the war rages on, millions are starving, facing the threat of displacement, and coping with a widespread cholera epidemic. Unfortunately, the lack of knowledge in the American collective consciousness makes it easy to brush off Yemen as another poor Muslim-majority country struggling with creating stability in the wake of the Arab Spring. However, the real story of how Yemen devolved into a crisis is much more complicated. Compared to its wealthy neighbors, most notably Saudi Arabia, Yemen is somewhat of an anomaly on the Arabian Peninsula. It’s not a wealthy monarchy, despite its oil reserves and placement on the heavily trafficked Bab-al-Mandeb Strait. Even before the outbreak of its current civil war in early 2015, Yemen was the poorest country in the Arab world; it was barely able to sustain its economy with its oil exports and was extremely reliant on imported food. Out of the 188 countries on the Human Development Index, Yemen ranks 168th. In 2014, the year before the outbreak of the civil war, nearly half of all Yemenis were suffering from food and water insecurity. This number had been consistently low over the last few years due to instability stemming from the Arab Spring and rising food prices across the globe. In particular, rising food prices became an issue due to the infertility of Yemen’s land (only four percent of the country’s land is arable). Since the unification of the Yemen Arab Republic (North Yemen) and the People’s Democratic Republic of Yemen (South Yemen) in 1990, creating a strong, centralized government has been a constant struggle. Disagreements about who should be in charge among regional and tribal actors—including attempts by the south to secede and a Shia separatist movement in the north—have impeded attempts at establishing a cohesive national identity. Interference from other countries and groups, especially Saudi Arabia and al-Qaeda, have also made it difficult for the country to stabilize. This all came to a head after the Arab Spring in 2011. A poor economy and government corruption spurred Yemenis to join the Arab Spring, resulting in the ousting of Ali Abdullah Saleh—who had been president since Yemen’s founding—in favor of Vice President Abdrabbah Mansour Hadi. A reconciliation process in 2014 brought together supporters of Saleh, Hadi, the Southern Movement, and the Houthis (a northern Shia separatist movement) in an attempt to re-stabilize the country. However, factions on all sides were left unsatisfied with how the power arrangement was restructured. The Houthis showed their dissatisfaction by taking advantage of the post-reconciliation unrest to regain power. With Saleh’s support, the Houthis moved south from their northern stronghold to take the capital of Sanaa in September of 2014. By 2015, the Houthis had founded their own government, and Hadi’s internationally recognized government fled south to Aden, one of Yemen’s most important port cities. Saudi Arabia quickly entered the conflict on Hadi’s side, claiming the Houthis were backed by Iran. Prior to the war, Iranian support was negligible, as the Houthis were a homegrown Shia group. However, Iran recently increased its support for the Houthis by arming the rebel group. Unlike Saudi Arabia, Iran’s military has not actively entered the conflict, but thanks to the actions of both countries, the conflict has become a proxy war between the two Middle Eastern powers. Saudi Arabia, the United States, and a coalition of Gulf states first intervened by setting up an airstrike program in early 2015, in addition to implementing a blockade in hopes of stopping the Houthis from receiving Iranian support. The United States is involved as part of its counterterrorism efforts: Al-Qaeda in the Arabian Peninsula (AQAP), which has had a presence in Yemen since the early 2000s, took advantage of the conflict to expand its territory. The Islamic State (IS) also carried out its first attacks in Yemen during the early months of the conflict but has yet to gain any actual territorial control. The involvement of Saudi Arabia, a coalition of Gulf States, Iran, and the United States, as well as the presence of international terrorist organizations, has escalated from what began as an attempt to mitigate an internal conflict to an international proxy war. Despite international involvement, territorial boundaries have remained mostly stable since the beginning of the war. However, civilian casualty rates have skyrocketed, in large part due to airstrikes and the ongoing blockade, which has made it difficult for aid to get to those who need it. By March 2017, over 4,000 civilians had been killed in the war and over 8,200 had been injured, according to the United Nations. Over 62% of the country’s population is facing food insecurity, and over half the country doesn’t have access to clean water. Of those suffering from food insecurity, 6.8 million are considered by the World Food Programme (WFP) to be “severely food insecure”, meaning that they are suffering from acute malnutrition and lack enough food for day-to-day survival. This includes 2.2 million acutely malnourished children. Moreover, the WFP considers three-quarters of the population to be in need of some kind of humanitarian assistance. Many aid groups, including the International Red Cross, WFP, Save the Children, Amnesty International, and the United Nations have attempted to bring relief to Yemen. However, they have been halted by the de facto Saudi blockade, poor infrastructure, and dangerous conditions in the interior due to fighting. The blockade prevents access to major ports, and Saudi forces are also blocking access to the airport which makes it extremely difficult for aid groups to get in. Saudi Arabia has also blocked the delivery of four cranes, provided by the World Food Programme, that could move supplies from ships to the ground more efficiently. Of course, Saudi Arabia isn’t the only actor standing in the way of aid groups. The Houthis control other ports and also refused to let in aid workers. Even if aid workers could enter the country, they would still face difficulties delivering aid throughout the remote interior. 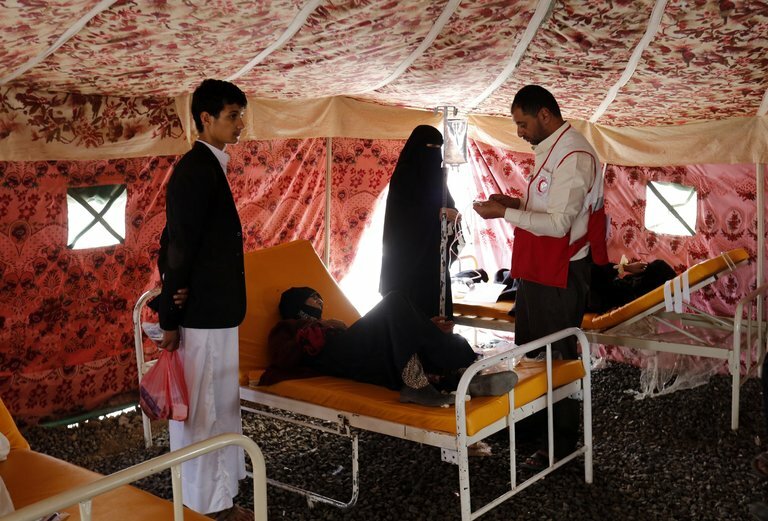 It doesn’t help that Yemen’s already poor medical infrastructure has been crippled by the conflict, leaving the country without the bare necessities. Unfortunately, medical infrastructure is exactly what Yemen needs right now. The depleted medical community has been unable to provide basic medical care and clean water and sanitation facilities, which has contributed to the spread of the disease. Yemen currently has 777,229 suspected cases of cholera (as of October 2017), 2,134 of which have been fatal. Haiti—which previously had the largest cholera outbreak—took seven years to reach the number of cases that Yemen has accumulated in a span of only six months. Without emergency aid, the Red Cross expects the number of cases to reach one million by the end of this year. To make matters worse, the majority of the patients are children under the age of 18, who are already at risk due to malnutrition. It’s doubtful that this epidemic would have occurred without the damage done to Yemen’s infrastructure by the civil war. As the war continues, it will remain difficult for aid to reach those who need it and to repair the infrastructure, allowing the outbreak to spread—and the war is unlikely to end anytime soon. The Houthis still control the territories in the west, including the capital of Sanaa. Peace talks in 2016 failed, and Saudi Arabia has continued its airstrike program aimed at targeting the rebels. The leader of the Southern Movement has now also threatened a referendum on secession, potentially making the conflict even more volatile. With the cholera outbreak and the rising numbers of civilians on the brink of starvation, the situation has become a humanitarian disaster. The only thing that can help end the humanitarian crisis and save the people of Yemen is the conclusion of the civil war and the restoration of a government that is capable of providing basic needs and services. Neither the Houthi government nor the exiled Hadi government has been able to keep its people safe, and the actions taken by both sides and their supporters only exacerbated civilian suffering. Trust among all sides is practically nonexistent, and while they continue to refuse to stand down, aid groups won’t be able to get into the country to do their job. Judging by the current state of the conflict, the violence and resultant humanitarian crisis will not subside anytime soon. The people of Yemen are facing an increasingly darker future and while the United Nations, U.S. lawmakers, and aid groups have called for a ceasefire so that aid can be brought in, nothing has worked. Hopefully, heightened international attention and pressure could spark some progress, but no major country has taken the lead. The Yemeni Civil War is a bleak situation, but it does not have to be. Hopefully, the more people become aware of this conflict, the faster it will come to an end.